Paramedic Theresa Hartman’s EMS career began seven years ago. 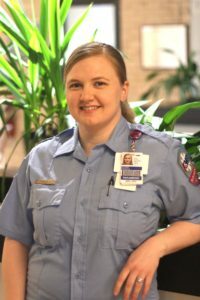 In addition to demonstrating excellent clinical skills, Theresa is known for showing incredible kindness and deep compassion to everyone she encounters – patients, their family members, hospital staff, and first responders – regardless of their station in life. Theresa is working toward becoming a Field Training Officer and Critical Care Paramedic. Theresa, fellow Star of Life nominee Tracy Allen, and their partners, responded last August to the call that no one wants to receive – members of their EMS family had been involved in a serious accident while on duty. Theresa and Tracy provided life-saving care to their colleagues and, later, volunteered to transfer their most critically injured teammate from the initial receiving hospital to a higher-level trauma center.